I have recently started working with Microsoft Teams. Like other communication platforms, third party integrations make the platform ever more powerful. 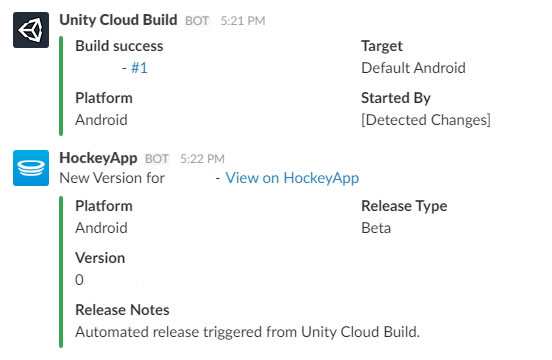 One integration I wanted was to alert members of the project I was working on when new builds were published to HockeyApp. With Slack, the integration was simple and produced an informative result within the target channels. With Teams however, while simple to setup, the produced result is less than informative. As you can see, less than seller. But not surprising, as Teams doesn't know how to interpret and display generic web hooks, as they all come in different shapes and sizes. Microsoft expects third parties to create custom connectors. Microsoft's next generation of HockeyApp (Mobile Center) has a connector on the roadmap, but nothing is expected to be done with HockeyApp. This tutorial will look into translating our HockeyApp web hook, but can be adapted to work for any service that supports web hooks. I'll be assuming that you know the basics of creating a flow, so lets get started by logging into Flow and select "Create from blank". First thing we need to do is set up an end point within Flow that HockeyApp can post our web hook notification to. Within the Triggers section, look for the trigger Request/Response - Request. Once we've selected this trigger, we will need to tell Flow how to interpret the results so that it can use them later on in the flow. This can be done either by uploading a schema or by uploading an example response. For HockeyApp, we can get an example of the payload from their web hook tutorial, where we'll be using the payload of Version Released. Once uploaded, our result should look like the following. An incoming web hook URL wont be generated until we've saved our flow, so we'll come back to this at the end. Once Flow has received our incoming web hook, we'll want to translate the results into a nicely formatted message to send to Teams. This can be done by adding an action following on from our trigger called Data Operations - Compose. Within the input field, we can then format our web hook input into something more informative using the provided data. We do this by adding Dynamic Content to our input, which is available as an overlay to the right of the action. These variables are generated from our trigger's schema and can be used in conjunction with fixed text. They're added simply by tapping the relevant variable. As our input will be used within Teams, our input will use markdown to stylise the content. I'm needing just the title, version and notes from HockeyApp, but you can include anything that is available to you. Our result should now look something like the follow. When Flow posts the data to Teams, it is posted on behalf of your account. This just looks odd to other users and I'm not sure if you'll get notifications when Flow posts on your behalf. The Teams integration doesn't support markdown for some reason. As this is still in preview, this will probably be fixed before final release. Because of these problems, we're going to send our data to an incoming web hook made in Teams. Therefore, go to Teams and setup an incoming webhook. I like to give it a bit of style and therefore call it HockeyApp with the official logo to make it look official when posting. As you can see, we're using Dynamic Content with our body, this time pointing at our generated payload from the translating stage to determine the content to send. Finally give the Flow a name and save it. So we have our flow, but now we need to configure our service, HockeyApp, to send data to it to start the flow off. Open up the Flow we've just created and select the first trigger. Now that our Flow has been saved, a URL should be generated within the HTTP POST URL field. Click the nice copy icon to copy it to your clipboard. Once the endpoint URL has been copied, navigate to your service and setup the webhook. For HockeyApp, this can be done by following their tutorial, using the Flow URL as the target. To test, you will either need to upload a new version to HockeyApp or use a tool like Postman to send an example payload to the URL generated by the flow. When you do either of these, you should see the new message pop up in Teams.